We’ve seen monophonic/duophonic synths. We’ve seen new analog keyboards. What we haven’t seen is analog keyboards that seemed to be designed when an inventory of pads and knobs exploded – in your face. 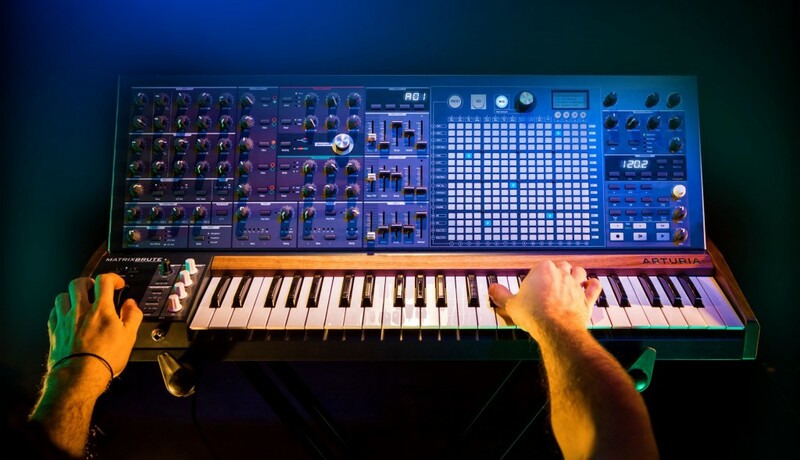 And that’s what the new Arturia MatrixBrute is. It looks like a fake Photoshop mockup you’d see on a forum, perhaps. But it’s real. All real. Close your eyes for a second and let your retinas recover, and let’s sort out what is actually even happening here. The specs make some sense. Three “Brute” oscillators (saw, pulse, tri) plus sub-oscillator. 49 keys, with aftertouch, full-sized. The modulation matrix is where things get a bit … hectic. Arturia says the idea is to give you modular “without the painful patching practice.” Instead, all the routings are accessible by a light-up, touch matrix. In MOD mode, any of 16 modulation sources can go to any of 18 modulation destinations – no patch cords needed. An E-Ink display shows you what’s going on. As a sequencer, the same matrix lets you create patterns, with STEP, ACCENT, SLIDE, and MODULATION options – sort of monome/Push/Launchpad-style. In PRESET mode, the matrix simply lets you hit one of 8×8 presets. (Basically, instead of turning a knob.) Okay, of the three, that’s sort of a waste of that giant set of buttons, but it’s there if you want it. As for the synth itself, it really is apparently 100% analog signal path, with chorus, delay, and flanger analog effects, all route-able from the matrix. 12 CV inputs and outputs (a lot of them). There’s also free editor/librarian software.